Citation Information: J Clin Invest. 2005;115(12):3400-3403. https://doi.org/10.1172/JCI27160. The recent discovery of the Gi protein–coupled receptor GPR109A (HM74A in humans; PUMA-G in mice) as a receptor for nicotinic acid has provided the opportunity to gain greater understanding of the underlying biology contributing to the clinical efficacy (increases in HDL, decreases in VLDL, LDL, and triglycerides) and the characteristic side-effect profile of nicotinic acid. GPR109A has been proven to be the molecular target for the actions of nicotinic acid on adipose tissue, and in this issue of the JCI, Benyó et al. have confirmed the involvement of GPR109A in the nicotinic acid–induced flushing response, a common side effect. The involvement of GPR109A in both the desirable and undesirable clinical actions of nicotinic acid raises interesting questions regarding the function of this receptor. Activation of the Gi protein–coupled receptor GPR109A (HM74A in humans; PUMA-G in mice) can produce differential responses depending on the location of the receptor. It has been proposed that, when nicotinic acid activates GPR109A on adipocytes, the resultant antilipolytic effects contribute to the highly desirable normalization of lipoprotein profiles. 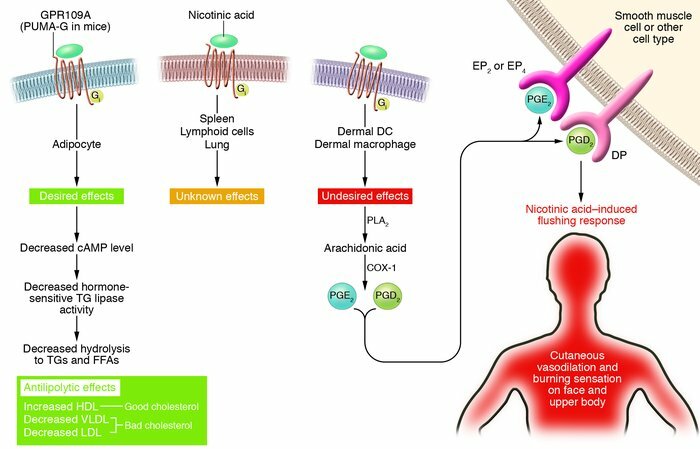 However, when nicotinic acid activates GPR109A on dermal dendritic cells or dermal macrophages, the subsequent mobilization of arachidonic acid and its conversion to vasodilatory prostaglandins (PGD2 and PGE2) results in the characteristic flushing response. As GPR109A expression extends beyond adipose and immune cells located in the skin (e.g., spleen, lymphoid cells, and lung), it is likely that activation of GPR109A in these cells/tissues may also contribute to the clinical efficacy of nicotinic acid. PLA2, phospholipase A2; TG, triglyceride.